AUSTIN, Texas -- No. 3 Texas Volleyball makes its 32nd NCAA tournament appearance this week when it hosts the first and second rounds on Thursday, Dec. 3 and Friday, Dec. 4 at Gregory Gym. Texas (25-2, 15-1) earned the No. 3 overall seed in the tournament and the No. 1 seed in the Austin Regional. The Horns welcome SMU, Purdue and UT's first-round opponent, Fairfield, as the Longhorns host for the 12th-straight season. SMU faces Purdue at 4:30 p.m. and Texas takes on Fairfield at 7 p.m., or 30 minutes after the conclusion of the first match. The winners of the two matches meet on Friday at 8 p.m. The winner of the Austin Sub-Regional advances to the Austin Regional, where it faces the winner of the Des Moines Regional in the NCAA "Final Four." Regional matches are played at Gregory Gym on Dec. 11 and 12. 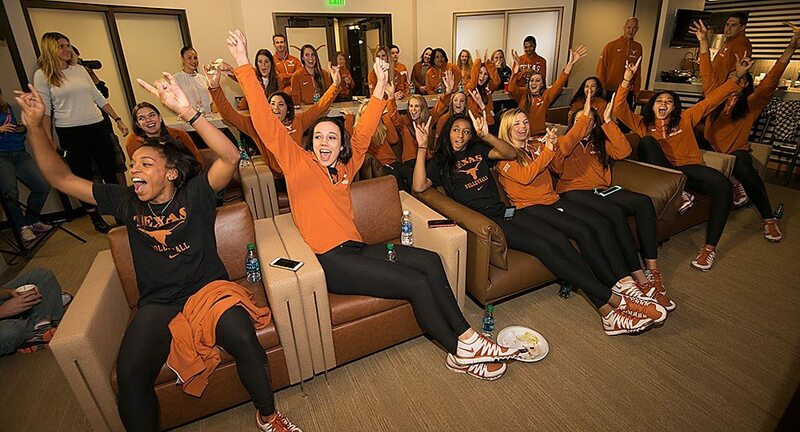 Texas has been selected to host the first and second rounds of the NCAA tournament 26 times and UT is 58-9 all-time in NCAA matches played in Austin. The Horns are undefeated in first-round contests at 28-0. First and second round all-session and single-daty tickets are available now. Tickets may be purchased at TexasSports.com/Tickets, by calling 512-471-3333, or in person at the Sandeep Soni Ticket Office in Bellmont Hall (Monday-Thursday, 9 a.m.-5 p.m. and Friday 9 a.m.-4 p.m.). Tickets based on availability. On the teams in their part of the bracket: This is probably the most competitive bracket that I've ever had since I've been a coach. Right now, there are probably 14 to 16 teams that have a chance to get to the Final Four. There isn't one really dominant team that can win easily, so it's going to be a challenge for us. We are going to start with Fairfield on Thursday night and will have a very tough potential second-round matchup already. But you have to be able to get through that and advance. On starting the postseason: There is a huge difference in terms of intensity, because it is one and done. The way that you approach it, your preparation, the way that you deal with stress and the way that you execute in crunch time are all factors. You need to get a little lucky and you need to be playing at a high level. You need to play well enough to win and find a way to get to the next round. On their region: I thought we would be a No. 2 or No. 3 overall. I think we are right where we thought we would be, I think it's very fair. With Texas A&M hosting, it put some teams that would normally be in our region out of our region, so potentially our second-round matchup could be a lot tougher. But we have been in these high-level situations before, so we will just get prepared for Fairfield. On if the intensity is different now: I think for the freshmen and sophomores, they are still a little nervous and tense. It is all pretty new still, but when you have been here for a while, it's exciting and I'm a little nervous, but at the same time, it's 'go time' from here on out, so I'm more focused and ready to just go for it. On how they need to approach the postseason: Jerritt made the point earlier that yes, we won the Big 12 and that's a huge accomplishment for our team and we have built trust in that, but from here on out, it is 0-0. We are here to win the National Championship. On the No. 3 seed: I was telling Kat Brooks that my palms were sweating during the show, so I am a little nervous and it was exciting to see who we were going to play first, so next up is Fairfield. It's all just exciting. I love tournament time and I love its intensity. It's all do or die, like war. On her initial reaction to the seed: It's exciting. You kind of guess where you're going to be at the beginning of it all, but to see your name on the screen is an unbelievable feeling and we are just really blessed that we are here once again. On looking to postseason: I think a lot of coaches are making it clear that we are 0-0 now, so it doesn't matter what you were in conference or who you played. Everyone starts with a clean slate right now, so it's just competing every day no matter who you are playing, competing against every opponent like it's your last. On their home court advantage: It's amazing. Our fans are always behind us and loud and cheerful. It's just exciting to play in Gregory Gym, especially in that environment and that pressure. It's great to see our fans there. On her initial reaction to the seed and bracket: It's really exciting every year. I think in the bracket this year, anyone can win and there will be a lot of upsets. There are a ton of teams that will be able to go really far in the tournament. It's exciting and you want to get anxious about who you're going to play, but you can't. Our focus is Fairfield on Thursday. On what changes now that it's tournament time: We will have the same mentality that we had in conference, but will look at this as a whole new season. It's a fresh start. We just are going to use the same routines, not really change anything, try not to get more hyped up for the games. It's just a regular volleyball game. It's intense because it's the tournament, but you have to prepare the same way. On if their finish last year will affect them: We just really try not to look at teams we have played in the past. Wisconsin and BYU were not highly ranked, so we just need to focus on each team and know that they are going to come out and give us their best shot.